Our faith is strong at St. Christopher School! As a Catholic school, we believe that our spiritual foundation is the basis for all that we do to help our students grow into moral, responsible young men and women. Daily religious study, liturgical celebrations, special visitors and events, and service projects combine to make faith an integral part of every day at St. Christopher School. 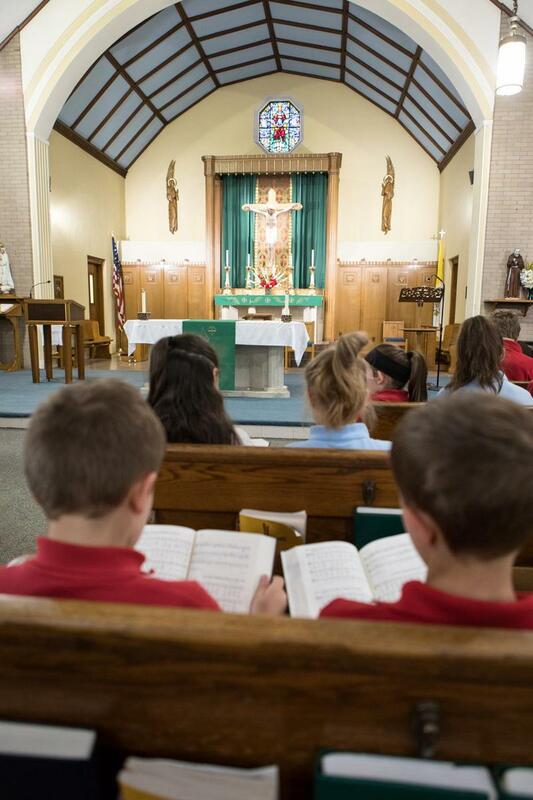 Every grade receives religious instruction as part of their daily curriculum. In addition, teachers strive to incorporate moral lessons into their everyday interaction with their students, so that students understand faith is something to be lived, not just studied. Masses and prayer services are held at least once each month and on Holy Days. Each mass is completely prepared and presented by a class. In addition, students from throughout the school participate as altar servers, cantors, and musicians. For most masses, our school pastor, Fr. David Harris, is the main celebrant. Parents, parishioners, and other members of our school community are invited to join us at all of our liturgical celebrations. Please see the schedule below! At St. Christopher School, we believe that we are called to be active members of our community through service to others. The school participates in a number of service projects throughout the year, including collections for the Corpus Christi Food Pantry, the St. Vincent dePaul Society, the Nashua Humane Society, and more. Vocation Day is a once-yearly day devoted to vocations within the church. Priests, deacons, sisters, and lay individuals living out their God-given vocations spend the day at the school and share their vocation stories with the children. The day also includes a mass and an afternoon of special activities. Taking to heart the idea that the best example is by action, this group of parents meets regularly to plan a number of activities to augment the faith of the community at St. Christopher School. All parents are welcome to join the group! For further information, please email FaithOutreach@stchrisschoolnh.org.